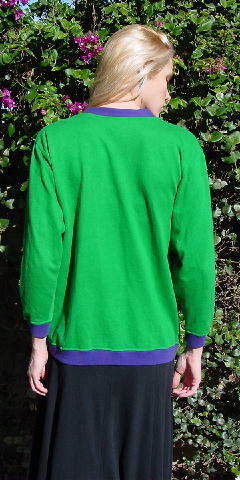 This vintage jacket is in grass green with purple edging around the neckline, down the front, around the cuffs and bottom, and on the 2 front pockets. 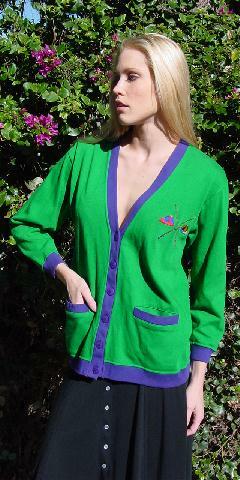 It has 6 purple buttons down the front with her name on each one. It's 100% cotton and was made in Hong Kong. 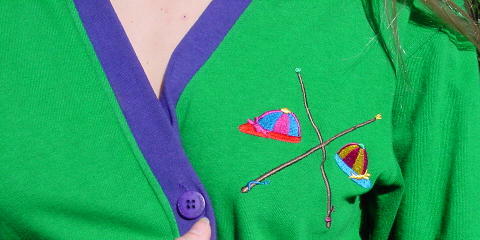 The left side has 2 little multicolored jockey caps and crossed riding crops. It's perfect to wear if you're going to the race track. It was used in a photo shoot at a race track.